One boy. One disappointing superpower. 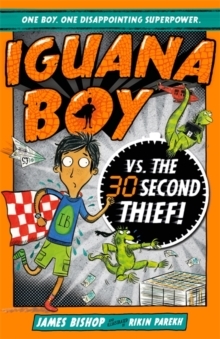 Can Dylan and his bunch of hyper iguanas make a lasting impression on the superhero collective, run by Ron Strongman, or will he be laughed out of town?He might have the lamest superpower ever but Dylan, AKA Iguana Boy, has proven himself worthy enough to be accepted into the superhero collective. Dylan is excited and his iguanas are hyper. Recipe for success, RIGHT?Iguana Boy and his team of iguanas eagerly await their orders to SAVE THE WORLD. But CEO of the Superhero Collective Ron Strongman doesn't have time for lowly superheroes. Dylan will have to find his own way to get to the top, or else he will be saving silly cats from trees FOREVER. When a new villain is causing chaos across London, Dylan can't believe his luck... this is his chance. Can Iguana Boy bring Repeat Offender to justice ... In 30 seconds or less!